Prev Unwrap and Get Crafty Next Surprise Dad with the Smallest Toolbox Ever! School is ending and the long days of summer will soon be upon us. So it’s time for craft projects to keep those restless kiddos entertained. 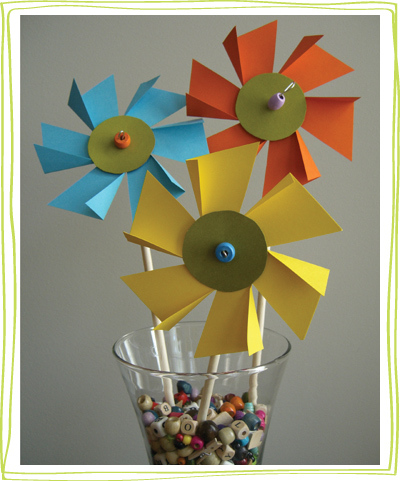 These simple pinwheels can be made for decorations, party favors, or just for fun. We made ours with colored card stock, but you might try cereal boxes, or you could use plain paper and let the kids draw or paint a design. 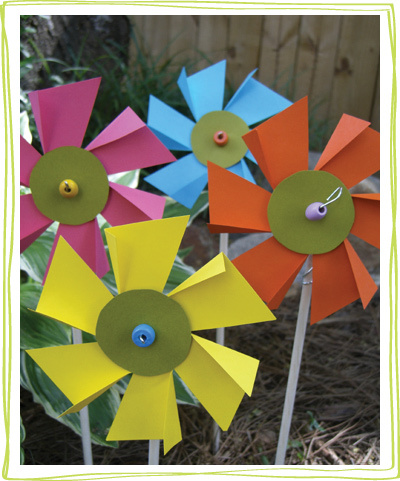 You could put them on skewers and decorate a cake with them, plant them in your garden, or make a garland of pinwheels. You could use sticks from your yard instead of the dowel rods for a natural look. And you could draw faces on the circle to make flower people. 3. Fold down corners along one side of each flower petal. 4. Unbend a paper clip and slip a bead on it. Bend at the end to secure the bead. 5. Assemble the pinwheel with the circle next, then the pinwheel flower, and finally another bead. 6. 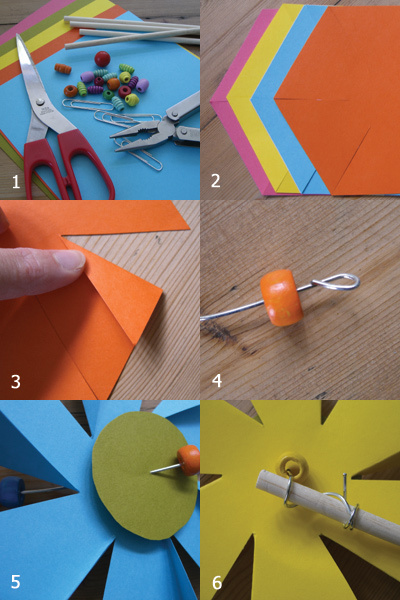 Wrap the end of the paper clip tightly around the top of the dowel rod, making sure to bend in sharp points. These are really cute – I think we will try them out today. THANKS! I love it!!! I babysit my brother in the summer and I am definitely going to do this!!!! These are really cute but A LOT harder than the directions make it sound. They keep drooping in front and look funny.